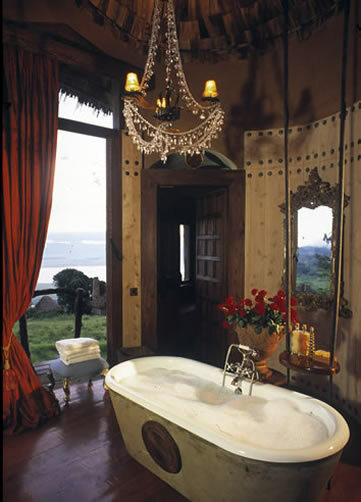 We left the plains and the relative simplicity of Under Canvas for what is arguably one of the most indulgent bush destinations in existence� the Ngorongoro Crater Lodge. A place so opulent, it could be an Indian palace. Being the rainy season (a good time to go if you�d like to avoid the crowds), the steep ascent from the landing strip to this splendid spot was marked by misty, deep-red mud roads slick with rain, bound by a tangle of lush, glimmering green vegetation on either side: lovely after the vast, dry expanses of the plains. 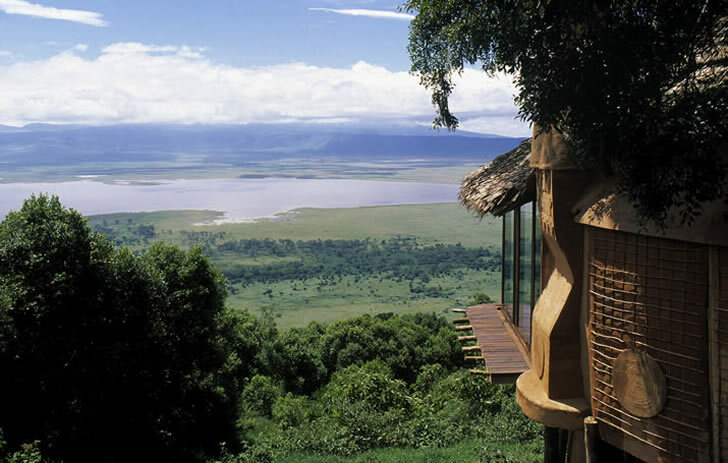 Ngorongoro Crater Lodge perches on the edge of the crater rim like something out of a Jules Verne novel. It�s a crazed lover, dressed in roses, velvet and silk, waiting to enfold you in its mad embrace. The sight of the verdant crater below with its flamingo-covered lake in the centre does grab the heart, so it�s an understandable response to the site. Not one many would dare to act on, but architect Silvio Rech and interior designer Chris Browne have made it work (with a good dose of humour too). 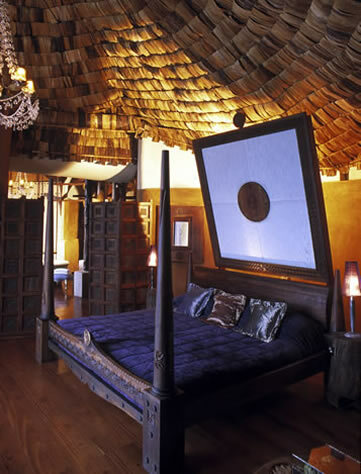 So unexpected but yet so contextual � the various mud structures making up the lodge are reminiscent of temples in Mali and traditional Masai houses: organic, curvaceous, raised on stilts with big views and interiors so flamboyant they�ll knock the minimalist out of you. Masai traditional dress is bright and bejewelled and it is refreshing to see this reflected, rather than the stone, bone and savannah story � however beautiful � again. It is impossible not to be happy here. Resident buffalo graze contentedly around the camp (Masai escorts ensure that you�re kept safe from them), there are sumptuous nooks aplenty in the public spaces to curl up in and an endless array of fantastic food. That is of you�re interested in leaving your suite. Large fireplaces, enormous beds, chandeliers, port,,a little glass box filled with biscuits, fudge, chocolates and Turkish delight, and baths drawn to perfection by your personal butler are some of things to tempt you. Rangers here are more laid back than the average and there is only one game drive a day as the area covers only 260 square kilometres. The drive down is extraordinary and the game sightings virtually guaranteed. We were lucky enough to see the wildflowers in bloom on the crater floor, their sweet scent wafting over us as we watched the elephant bulls or a lion shaking its mane. Ngorongoro Crater is the only park in Tanzania (and one of the few anywhere) where people are allowed to co-exist with wild animals � the Masai take their cattle down to the crater to graze and drink. Lion are said to fear the Masai but when walking with an armed park ranger along the crater rim, he suggested that it is their �medicine� � an ability to communicate with the lion and to be allowed access � that keeps them safe. This was a fascinating glimpse of a larger story that even direct questioning of a Masai tribesman, while hunkered down in a hut in his village, couldn't access. Unlike India, the mystery does not open easily even though the Tanzanian people are warm and very welcoming. In Africa, safaris are so set on finding wildlife that the subtleties can be missed. In India, they are integrated and very visible. It is often necessary to communicate the desire to slow down in Africa and to step onto the earth, just to appreciate being in some of its most extraordinary places. Even so, there are sights and moments on this continent that will stop your heart and bring it back to an old, wild beat in harmony with the earth. * You may be pestered by tsetse flies, so along with an anti-histamine, pack pants or long trousers that have a drawstring at the ankles and long sleeved, light cotton tops. This works for mosquitoes too. * Safari always means khaki but Ngorongoro Crater Lodge warrants a red velvet jacket and dapper shoes for him and a bright silk dress and some sparkly shoes for her. *There are iPod docking stations at NCL and Debussy�s Piano Concertos are a lovely accompaniment to the beautiful view and extravagant suites, so load them before you go. *Romance is the order of the day here, so pack something for the bedroom too. 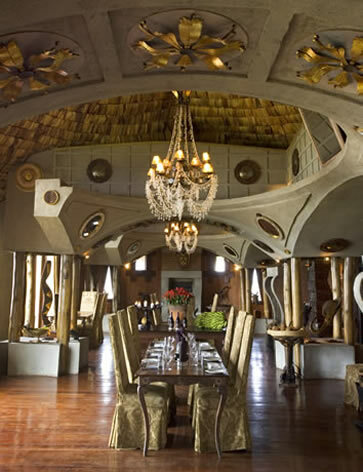 Ngorongoro Crater Lodge was featured in the Travel + Leisure Top 500 List for its �architecture and design that nearly rival the extraordinary natural surroundings�.